Blizzard have decided that WoW’s dungeon finder is perhaps a little too efficient. The grouping tool pulls strangers together for five-man dungeons, and fires them off on their separate ways immediately afterwards. No time lost – but all too often, no friends gained either. 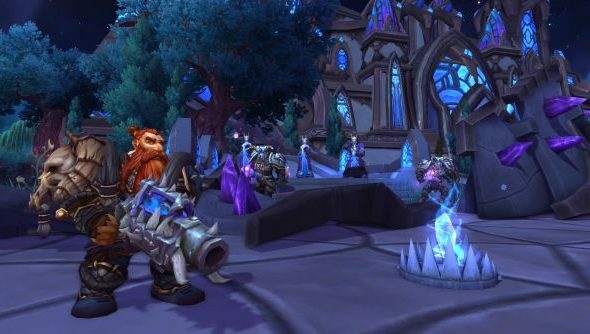 “The pre-made group finder we’re introducing in Warlords of Draenor is very much trying to take a step back in the direction of World of Warcraft being a place where you can actually meet new people,” said lead designer Ion Hazzikostas. Hazzikostas told Eurogamer that WoW’s looking-for-group systems were useful for players with “unpredictable schedules” or too few friends playing the game. But he acknowledged they don’t provide a “social experience”. The Draenor group finder will provide that – a framework for players to find others with similar goals, and perhaps go on to tackle greater challenges with their new acquaintances. “There’s something about the act of having to send someone a tell, or actually manually invite someone to a group,” explained Hazzikostas. “Even if you just end up with a group of people you’ve never met before and go and do a dungeon, people actually end up talking a lot more. The idea is that you’ll add a great tank to your friend list, and maybe invite them to raid at the weekend. One thing leads to another, and they’re in your guild. Are you ready for a more social experience in WoW? There isn’t much time left to adapt:World of Warcraft patch 6.0.2, Blizzard’s “overture” for Warlords of Draenor, landed today.